Be intrigued with us! Watch a thrilling film that will change your life. Learn more about behind-the-scene effects of your healthcare and food. Even if you change one thing in your life...it will impact millions. You have control of your life and health. The time is NOW. This is a MUST-SEE film! We will be showing "Doctored" and providing a catered dinner. The movie will begin at approximately 6:30, so please arrive by 6:15. Invite your friends and family to join you, but just please let us know how many spaces to reserve by July 18th! The "Tampons & Tiaras" fundraiser event is happening Saturday, July 13 from 7-11AM. A chance to walk, stroll, run or ride your bike to support Westside Cares in providing feminine hygiene products to women in our community who do not have sanitary products each month. The entry "fee" to participate in the event is... Feminine Hygiene Products! Any amount, any kind will do. The more, the better. Pick up a flyer in our office, detailing the location of the event, near Walmart on S. 8th Street. 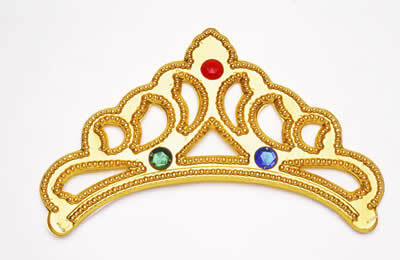 The first 200 participants bringing donations will receive a Tiara! Dr. Candice wants to help and needs you too! Cash patients - Bring in a package containing 8 or more tampons (or bag of maxis) and receive $10.00 off! It's the heart of summer and we've got lots of news, products and events to share with you! From free ice cream, a must-see movie night complete with dinner, a fundraiser with a funny name, schedule changes, an awesome new patient special and foot bath treatments, there's something that will surely interest you in this month's newsletter. New Patient Special, 1/2 OFF!! 1/2 price on ALL visits, including the initial exam/evaluation. Please pass this info on to your friends, family, and anyone else you know who's looking for quality chiropractic care! Our office will be CLOSED July 1-5 for chiropractic patients. Ivy will still be available for massage, but appointments will need to be scheduled in advance!!! Friday, July 12 we will be open, as that day will be considered the first Friday of the month, since the office vacation falls on the "real" first Friday. Ivy will be out of the office July 22 - July 26. Massage can be scheduled with Kelley during Ivy's absence, but please plan ahead and schedule early. Beginning the week of July 29 we are changing our evening hours to Tues. & Thurs., SO we will be open 9-2 Wed, July 31 & have evening hours from 4-6:30pm on Thursday, August 1. Want to Schedule Your Own Appointments? Patients can now schedule from our website! Just click on the "schedule" button, pick Ivy or Dr. Candice and choose a time. We receive notification & confirm or contact you, the patient, if changes need to happen. Very handy for those midnight thoughts of needing an appointment! Have YOU received your complimentary EB Pro treatment? All patients are invited to receive their first treatment FREE. Future treatments are $40/each or $30 if a package of 5 or more are purchased. Restored vitality...more mental clarity...clear skin...a stronger immune system...and looking and feeling healthy. By detoxifying your body, you can enjoy these benefits...and more. Designed and developed to restore the body's balance and energy levels through exposure to an ion field, the EB-Pro™ ion therapy device utilizes direct current to create an electromagnetic field, in which the patient places their hands or feet in an liquid salt and mineral solution to increase the energy and the positively charged cellular activity. The patient is exposed to a low intensity ion field and by immersing the feet in the water, where an electrical current will be enabled to make contact with all the primary meridians in the body. Trapped molecules (toxins), that have been ionically bound, will then be freed and can exit the body through the open meridians, or pathways, to be released into the liquid foot bath. Is it safe? Yes. The EB-Pro™ Ion Therapy Systems are only direct current units to ensure no unwanted power transients or static sounds are passed to the body. Average treatment time 18-23 minutes. Healthy individuals often feel more energy, and experience a greater feeling of well-being. Patients with pain, edema, gout, headaches, and swollen joints have often reported immediate relief. Other patients with arthritis, allergies, lymph edema, neuralgia and other symptoms have experienced relief and benefits with multiple treatments. Body toxins can come from the air people breathe, the water they drink, the food they eat and their lifestyle. Stress and depression are body toxins too. Did you know that toxins, stored in the body over time, produce inflammation in the body, which then creates such degenerative diseases as cancer, diabetes, arthritis and heart disease? Rid your body of toxins by soaking your feet in this amazing foot bath that Dr. Candice now has in the office! We are also now offering Detox Wraps.....please inquire at your next appointment with Dr. Candice. ...and rewarded! We thank you for your referrals of friends, family and co-workers! For the summer months, we will continue to reward our patients who make referrals with a FREE EB-PRO treatment AND ice cream. That's a pretty sweet deal.